The Russian T-72 ARV Family aka BREM-1 (Bronirovannaya Remontno-evakuatsionnaya-1) Armoured Recovery Vehicle (ARV) was developed by the Ural Transport Engineering Design Bureau to support the widely deployed Russian-designed T-72 series MBT. Following extensive trials with prototype vehicles, production commenced in 1983 with first production vehicles being completed in 1984. Production of the BREM-1 ARV is undertaken on an as required basis. 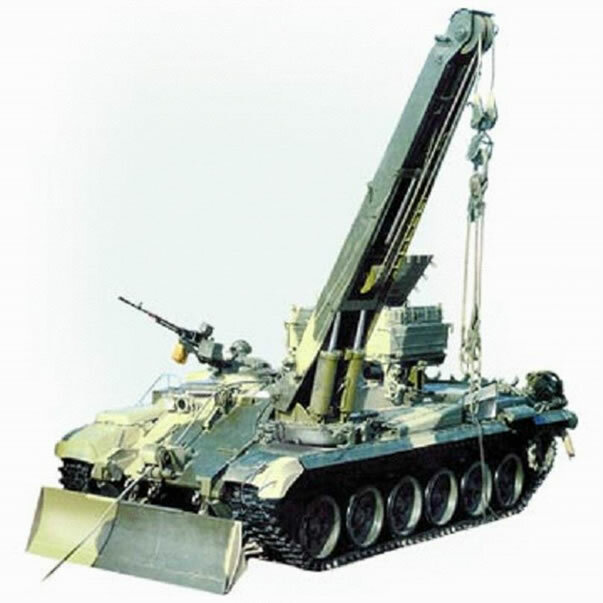 BREM-1M – improved version fitted with one-piece side bin, a more powerful crane and improved recovery tools. The crew can remain inside the vehicle for recovery operations. VT-72B (BRAM-72B) – Czechoslovak ARV based on BREM-1 with dozer blade with prominent rams mounted on the front of the vehicle, hydraulic crane on the right side of vehicle and a large built-up superstructure at the front of the hull with a large tackle block in front of it. VT-72M4 – Modernized VT-72 (BREM-72) ARV with T-72M4CZ upgrades including the power pack and communications upgrades. BTS-5B – Ukrainian version of the BREM-1.